Blog Post Why can’t I see all the keywords in Google Analytics? Why are keywords ‘not provided’ in Google Analytics? Are you looking over your monthly Google Analytics report or reviewing your WordPress Jetpack Site Stats and trying to figure out why you can’t see all the keywords that bring traffic to your web site? It’s very frustrating for web masters and business owners who want to see how users are looking for them on the Internet. What is a keyword? A keyword is a word or phrase typed into a search engine like Google, Bing, or Yahoo. Internet users type keywords into search engines looking for online information. A few years ago, Google began reducing the number of referring keywords visible to web site owners. They did this in the name of privacy. When an Internet user is logged into a personal Google account, as most are, Google protects the privacy of their search words. So when you see “anonymous” or “not provided” on your Google Analytics report, that is why. What search engine is used most? In the United States, Google dominates search engine use with 64- percent of all searches. When it comes to looking for local information, user preference for Google is even higher, with reported usage as high as 89-percent. Can I figure out what the hidden keywords are? The keywords that are labeled ‘not provided’ or ‘anonymous’ are very likely to be similar to the keywords that you can see on your reports. Based on the website traffic and Google Analytics we monitor for more than 100 clients, we see that Google typically shows us about 10-percent of the keywords used to find a website. If you are only seeing 10-percent of your total keywords, then you can multiply those you can see by 10. This will give you a more accurate picture of your in-bound traffic. 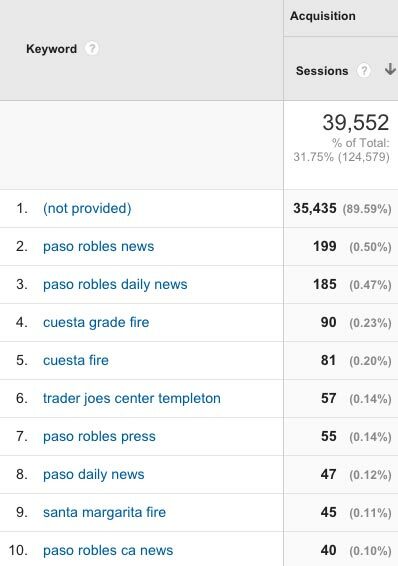 So, for example, in the keyword report above for the Paso Robles Daily News (for the month of August 2015), you can see that about 90-percent of the keywords are not provided. If you multiply the keywords we can see by ten, you will get an estimate of how Internet users are finding your site. These are just rough estimates and are not going to be perfect, but at least you can take some comfort in knowing that your site is generating a lot of traffic from keyword searches. You can keep scrolling on your Google Analytics report and dig in to your long-tail keywords. If you would like help reading your Google Analytics report, help setting up Google Analytics on your website, or a consultation on having a new website designed, give Access Publishing a call at (805) 226-9890. We specializing in web design, search engine optimization and online marketing.